American Express this year has upped its commitment to digital and social integrations at its sponsorship activations, first for golfers, and now for tennis fans attending the US Open tennis championships. The result is an all-new US Open American Express Tennis Fan Experience, complete with RFID, a text café, an augmented-reality “pro cam” and even a hologram. 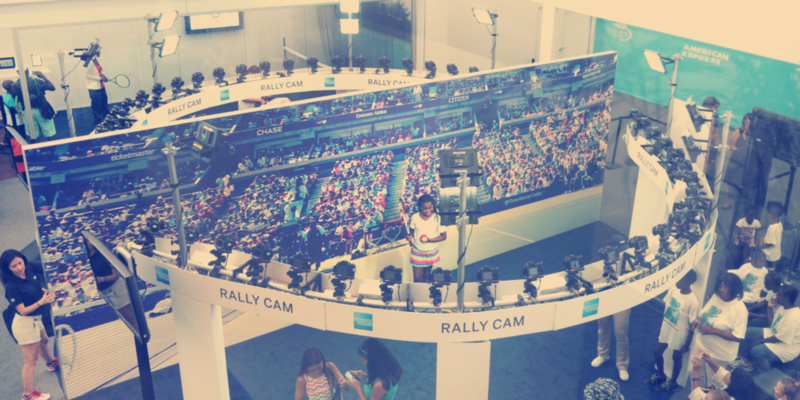 A 180-degree rally cam, which features a video camera set up before a photo of Arthur Ashe stadium, where people can pretend they just won the Open or smashed a serve on center court, then take the file home to share and upload onto their social networks. A digital PERCH table, which incorporates interactive display technology in an experience where attendees can engage with historical exhibits from the International Tennis Hall of Fame archives rather than merely looking at display cases. A hologram of 21-year-old tennis champion Sloane Stephens with which American Express card members can pose for shareable photos. A text café, complete with phone charging lockers and a social wall that brings to life the digital videos and photos, conversation and other news aggregated on the USTA’s TrendCast app. Three large social walls throughout the grounds are showcasing the latest US Open fan buzz from around the world.